Premedications are frequently given. Premedications are part of "multi-modal" anesthesia which will generally contain a combination of drugs such as a tranquilizer, sedative and analgesics. 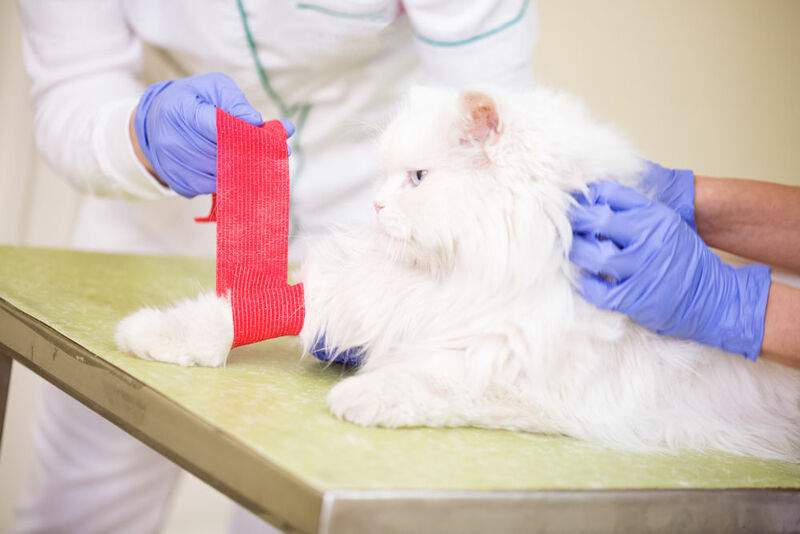 By using premedications, the cat goes under anesthesia more quickly and this allows easier intubation for controlling respirations which is important in brachycephalic (Persian, Himalayan, exotic) cats. Premedications include tranquilizers and sedatives to reduce anxiety which allows smooth induction and recovery. They also include analgesics to initiate pain management before the painful stimulus occurs (called windup pain) which lowers the total dose of pain medications needed. An IV catheter can also be placed after premedications are given to administer fluids and medications easily. Fluids given IV during anesthesia help to support blood pressure and allow quick access to the vascular system in the event of an emergency. Induction agents are used to quickly reach an anesthetic plane and allow placement of an endotracheal tube for delivery of a gas anesthetic agent to maintain anesthesia. Ketamine is a relatively short acting anesthetic which works by "dis-association" of the nervous system. It can be given intramuscularly combined with muscle relaxants and used for simple surgical procedures. However it is painful at the injection site when given IM. It more often is used IV (avoiding the painful injection reaction) as an induction agent in combination with diazepam (Valium) midazolam (Versed) to allow intubation and then gas anesthesia for maintenance. Propofol is also an injectable drug which has an extremely short duration of activity and must be given IV. It can be given as a constant IV infusion to maintain anesthesia for short procedures or again to allow intubation for gas anesthesia maintenance. Placement of the endotracheal tube allows for better oxygen ventilation and perfusion of tissues, including the brain. Isoflurane - Allows a rapid and smooth induction and recovery. Due to its inhalation properties; isoflurane does not enter tissues other than the respiratory tract in significant amounts allowing for additional safety and the speedy induction and recovery. Sevoflurane - This agent is similar to isoflurane but even faster with induction and recovery. However it's inhalation properties requires a higher percentage of gas to be mixed with oxygen for anesthesia maintenance and therefore is more expensive to purchase and use. In summary, the generally accepted methods for anesthesia utilize multi-modal agents. These combine premedications for anxiety relief, smooth induction and recovery as well as pain management; followed by induction agents to facilitate placement of a endotracheal tube to support respirations and anesthesia maintenance with a gas inhalation agent. When the procedures are finished and the inhalation agent is turned off; the patient breathes oxygen alone and begins recovering quickly. Just like with human beings, no one (and no animal) should be put under general anesthesia without a valid medical reason (necessity). In veterinary medicine, anesthesia should NOT be used for cosmetic reasons or to facilitate "ease in treating" an animal. Cats are known to have more difficulty with anesthesia than other animals. Persian cats, in particular, are known to have more difficulty with anesthesia. Anesthesia can be deadly!!! Additionally, NEVER let your veterinarian use Ketamine!! !